Athens' First Cemetery or Municipal Cemetery, is a peaceful spot in the city filled with many large olive and pine trees as well as the smell of incense burning from the well-tended tombs. Although not strictly a park as such, the green cemetery is filled with numerous plants and trees and does resemble a garden. There are many interesting tombs and some are real works of art in their own right. Locals tending the graves often make this a family outing and it is not unusual to find small groups of people having a picnic in the cemetery. The cemetery is a very large and very well maintained area deserving a walk or two. Cremation is not allowed by the Greek Orthodox Church. You are only allowed three years in your grave then they dig you up and put your bones in an ossuary to make room for the next guy. Unless you have your own mausoleum that is. Some of Greece's finest sculptors come from the island of Tinos and a lot of the work you will see is done by Tiniots. 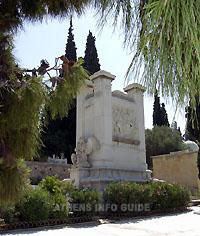 Many famous people are buried in the First Cemetery of Athens. You will find a lot of mausoleums from people who played a significant role in the history of Greece. The grave of, still very loved, Melina Mercouri is near the entrance of the cemetery. Learn more about Melina Mercouri. This cemetery is more than worthwhile visiting. 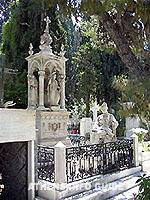 One of the most famous monuments of the first Cemetery is the Sleeping Maiden, the tombstone of Sofia Afentaki, a classicist work by Giannoulis Chalepas (1878). The girl seems to be sound asleep and nothing shows the rigidity of the dead body. In this way, the work fully corresponds to the model of the classicist tomb, according to which death is an eternal dreamless sleep. The sculpture owes its fame to a great degree to the artist’s tragedy, as this was his last work before his schizophrenia was manifested. Giannoulis Chalepas (1851-1938) was one of the most important representatives of Modern Greek sculpture. He came from Pirgos of the island of Tinos and studied in the School of Fine Arts of the Technical University in Athens as well as in the Academy of Fine Arts in Munich. Other known works of Chalepas are “Satyros and Eros” (1873-75) and the “Praying Woman” (1876-77). Unluckily his art, which was influenced by classicism, was shadowed by his mental illness.